Red Hot is a wonderful girl. She is large boned like her mom. 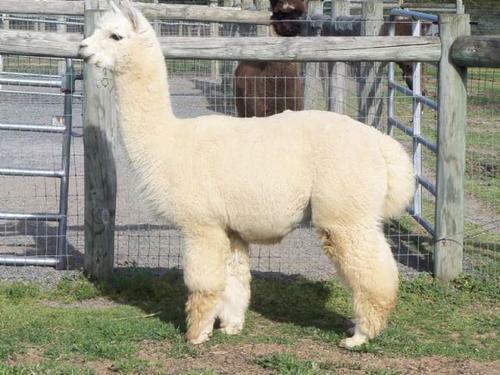 She stands very proud, moves out very correctly and has a very flashy color pattern to her fleece. She has turned out to be a real nice girl. Red Hot is out of the Royal Fawn bloodline. Vistors are quick to ask her name as they love here coloring. Red Hot had a handsome white male cria in November 2009 which we named Ice Breaker! He has very crimpy fleece and stands very proud! Look for him in the showring! Ice Breaker has a fleece that is in crimpy bundles along with density. It is a nice bright white fleece. He is of good size and good confirmation.